When would you like to stay at Tashkonak Hotel - Check Availability & Room Rates!!! 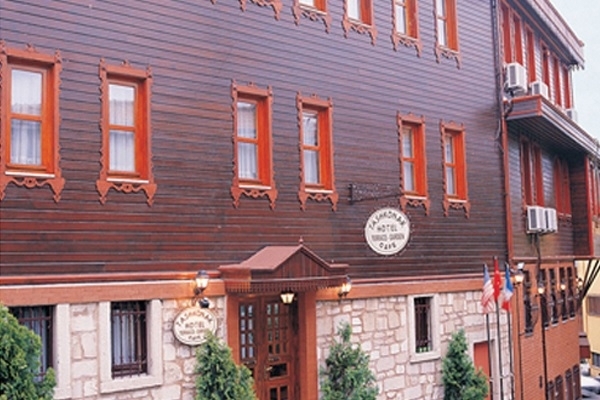 Tashkonak Hotel is located on Kucuk Ayasofya Street, Sultanahmet/ Istanbul. Tashkonak Hotel rooms are equipped with Lcd tv's, Air-Conditioner, wi-fi, safe box, minibar, hair dryer, The hotel has a lovely and cosy "secret" garden. Proud to be one of the best family-Friendly hotel in Istanbul, within walking distance of Blue Mosque, Hagia Sophia, Topkapi Palace. Tashkonak Hotel is decorated with Ottoman-style furniture. 32 guestrooms with decor in rich colors as well hardwood floors, 'Secret Cosy Garden'y garden, kept greens provide the perfect hideaway for relaxing. You can sit here in the sun while swigging a glass of fresh Turkish tea or coffee. How far and How long will it take from/to the Tashkonak Hotel Istanbul from/to International Airports and cruise Ports.